We check your order and make sure the costs are correct. We also contact IKEA® to check availabilty. We then contact you to confirm your order and that items are in stock and confirm delivery. If any items are out of stock or discontinued, you may give us an alternative or we may suggest one to you. Full payment will be required on delivery by either cash or cheque. Cheques to be made payable to Idlikeaflatpack. We usually deliver on the same day we go to IKEA®, usually late afternoon onwards. We will inform you if there is any change to this. IKEA® REGD. TRADEMARK OF INTER IKEA SYSTEMS B.V. 1999-2003. 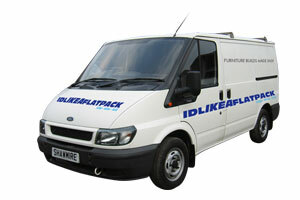 Idlikeaflatpack IS AN INDEPENDENT COMPANY SERVING THE SOUTH WEST AND NOT PART OF IKEA.